If you’re initially thinking that it seems strange for a dentist to be talking about facial rejuvenation, you’re not the only one. Dentists are the only health professional we see on a regular basis, especially when we think we are healthy. Most people only see their doctors and seek specialist opinions when they see or feel a problem, so there could be medical problems that remain undiagnosed until and unless you report feeling unwell or find something obviously abnormal. On the contrary, as a regular health service, dentists are uniquely privileged to be able to identify all kinds of medical issues from the conditions that present both inside and outside of a patient’s mouth. From the findings of your dental examination, a dentist is able to screen for conditions such as oral cancer, diabetes, hormonal changes, abnormal skin conditions including skin cancers, bleeding disorders and airway obstructions that correlate to sleep apnoea. If we detect any suspicious conditions, it is our duty of care to direct patients to their medical specialists for further investigation. The face is the ‘frame’ that presents your beautiful smile. When you put in time and effort to ensure that you have a healthy set of teeth, it’s important also to remember that the face and skin around that set of teeth also needs care and attention in order to also stay healthy to complete that beautiful smile. Dentists receive intensive training on the anatomy of the head and neck and are especially knowledgeable in the structures of the face, both inside and outside of the mouth. When it comes to safely injecting products and medications into the face, it’s important to ensure that the professional providing it has in-depth knowledge to navigate the complexity of the nerves, blood vessels, muscles and soft tissue of the head and neck. Your dental records and clinical photographs document the changes to the shape of your face as aging occurs, so it is possible to discuss early strategies to address its effects. A good skincare regime at home is just as important for maintaining a fresh and healthy smile as daily toothbrushing. Remember that the skin is the largest organ of your body – a living, breathing organ that protects us from harm. So, wouldn’t you want to look after it well as you would your liver or heart? At Myers Street Dental Clinic, as part of addressing the broader health message, your active maintenance discussion may also include talk about sun protection or appropriate active ingredients to look for in skin care products for your skin condition (such as acne, uneven skin tone or pigmentation). If you have questions about appropriate skin care for you, ask your dentist or oral health therapist to point you in the right direction. 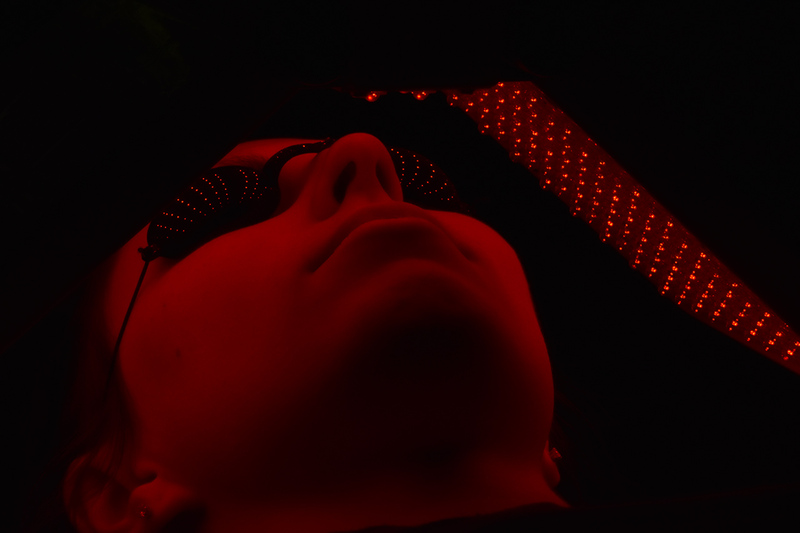 Also known as Light Therapy, LED Phototherapy is a method of using different wavelengths of light to stimulate the skin to combat certain skin conditions. Each wavelength (seen as varying colours), reaches different areas within the skin to boost the cell activity. The result is faster recovery from active skin treatments and injuries, calming sensitive and irritated skin. LED Phototherapy using the blue light is especially effective in treatment of active acne breakouts by killing the bacteria responsible for most breakouts. Acne scarring has also been seen to clear up after a few treatments at varying wavelengths. Best of all, even if you don’t have any specific injuries or blemishes to treat, the LED Phototherapy is great for boosting collagen and elastin production, producing a healthier-looking and glowing complexion. Collagen is naturally occurring in the body and is responsible for helping our body parts to keep its natural shape. Injuries and trauma to the skin (including acne) often causes scarring to occur as the skin recovers. 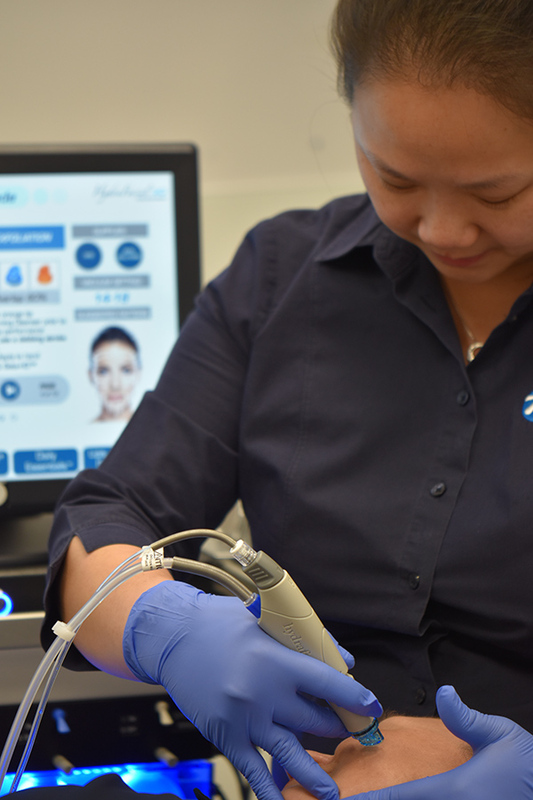 Collagen Induction Therapy or Dermal Micro-needling is performed using sterile, single-use micro-needles and with the use of local anaesthetic. The procedure is generally painless. Patients can expect to appear red in the skin (appearing as if sunburnt) for approximately 3 days after treatment, with the old skin peeling away in the first week or two. Depending on the skin type and area of concern, best results can be achieved after 4-6 treatments approximately 4-6 weeks apart. In areas of the face where there are deficiencies in the volume, dermal filler injections are effective in achieving better definition of facial features. The aim of facial injections with dermal fillers is not to turn back time or look younger –rather, the aim is to appear ‘less tired’ and ‘more refreshed’. Muscle-relaxing medications are used in the dental setting for treatment of over-active muscles that may cause facial pains, excessive clenching and grinding leading to frequently broke teeth or gummy-smiles (where the strong upper lip pulls up too high). In addition, the same drugs can also be injected into other muscles of the face for reduction of ‘at rest wrinkles’, which occur because of hyperactive muscle activity in the face. As everyone is an individual and there is not one single treatment that suits everyone, it is important to discuss your skin concerns with the dentist to determine the best therapies that suit you and your skin concerns. Speak to the team at Myers Street Dental Clinic to arrange an appointment to discuss how to best manage the skin and features of your face around your beautiful smile. DID YOU KNOW? Approximately 2 out of three 75-year olds have had a kind of skin cancer at least once in their lifetime?